This Year, Does Christmas Seem Like A Waste Of Money? 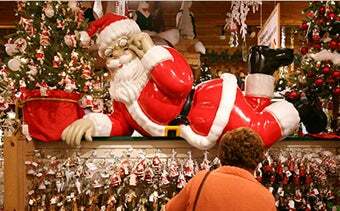 Not much on the sales floor at Bronner’s costs more than $10, [Bronner] said. "Even in times of economic turmoil, there comes a moment every fall when people look at the calendar and see that Christmas is still coming and it’s still on Dec. 25," added the company president, who that day had chosen from among his collection of novelty neckties one patterned with Christmas bulbs. "The $10 ornament that’s the perfect gift for Grandpa or Uncle Rob is not going to make or break anybody’s budget," he said.